Selling your business effectively and efficiently requires following a disciplined process which is individually tailored to your particular business. Fortunately, we have the depth of experience to understand what will work best for you. 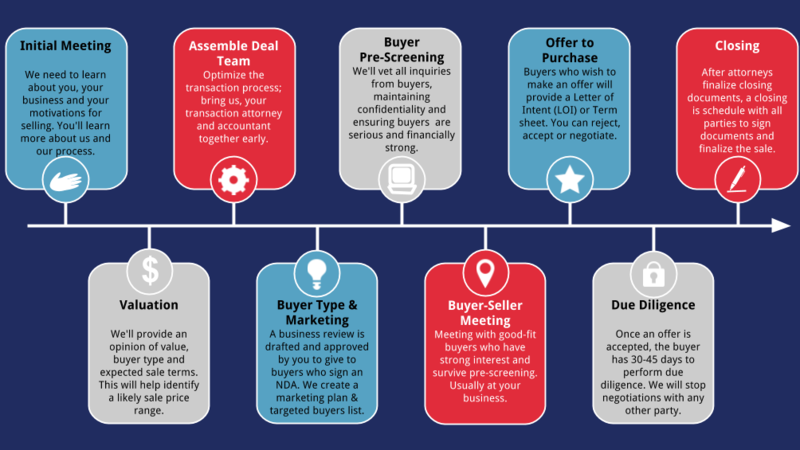 In general, however, the Selling Process can be described in 9 steps. We like to meet with you, preferably at your place of business because it gives us a better understanding of what it is that we are valuing and selling. If you would prefer to do it off-site, then you can either come to our office or arrange a place closer to your business. The meeting will allow us to get to know your business and better understand what you wish to achieve with the sale, explain the selling process, and review our fees and engagement requirements. All of this is done in strict confidence. If you like what we have to say, then we move to the next step to perform a complimentary, no-obligation valuation. Armed with this information, we will get back to you within 3 to 5 business days with an opinion of value which will detail the range of a most probable selling price, the expected terms of a sale, and the type of buyer that would be interested in your business. Typically, we also pre-screen the transaction with third party lenders to find out if the business can be financed. Ultimately, sellers need to know what the net proceeds of the sale will be after paying transaction fees and taxes. Our advice is that you meet with your accountant and financial planner to determine if this sum will be sufficient to meet your financial goals before making a decision on whether or not to sell. Transactions are best completed if all the advisors needed to work on it are brought together in the beginning as a team that is kept informed throughout the sale process. This team will include us as your intermediary, an accountant, a transaction attorney and your financial planner. If you don’t know a good transaction attorney or if your accountant is not well versed in understanding the tax implications of a sale, we can give you names of several accountants and attorneys that could represent you. Once the deal team is in place, we will draft a business review as the first step in the marketing process. This is a ten to a fifteen-page summary that describes the business, provides financial summaries, highlights opportunities, describes the markets in which it operates, identifies the competition, and gives details on the operations and personnel of the business. It is drafted so that it provides enough information to a prospective buyer to make an offer. We don’t begin to market the business until you’ve approved this document. It is never sent to a buyer until they’ve signed a confidentiality agreement and disclosed their financial resources available to purchase the business. Our internal database of 4,000 buyers including individuals, investors, and representatives from over 325 Private Equity Groups. A subscribed database of over 2,700 Private Equity Groups. Research from subscribed databases such as Hoovers and internet searches that allow us to develop possible strategic buyer candidates. Posting a generic confidential description of the business on 7 different business brokerage websites to which we subscribe and which buyers from all over the world review. Whether the marketing is targeted or broad-brushed, we proceed only after you approve it. Our hope is that we develop three or more interested buyers, creating competition to maximize the sale price. Buyer inquiries from our marketing are vetted through interviewing them in person or over the phone after they’ve signed a non-disclosure agreement and given us an understanding of their financial strength. They are then given the business review. If confidentiality is a particularly sensitive issue, we will run their names by you before releasing any information. If the buyers survive our pre-screening process and appear to be good prospects with a strong interest in the business, we then set up a meeting with you. More often than not, buyers want to see your business. On-site visits are usually scheduled after hours or whenever you are comfortable showing the business. A representative from our firm is always present at these meetings. After the meeting, a buyer may wish to make an offer. If that is the case, we ask that they do so in the form of a non-binding Letter of Intent (LOI) or Indication of Interest (IOI) in which the basic terms of a transaction are outlined. These typically include the purchase price, terms, method of payment, training and consulting agreements, non-compete agreements, and any other critical issues the transaction must deal with. We will discuss the offer with you, make recommendations and you will decide to either accept it, reject it or continue to negotiate until an offer is accepted. In cases where there are multiple offers, we will set up a process where all buyers are treated fairly and which is conducted expeditiously so that you achieve the best possible offer. Generally, once an LOI or offer is accepted, the buyer has 30 to 45 days to perform its due diligence. During this period, you agree not to negotiate with any other party, but we continue to field buyer inquiries so that we can contact them should the transaction not close. During due diligence, the buyer will wish to verify much of what was shown in the business review by looking at tax returns, bank statements, copies of leases, contracts with customers and suppliers, etc. We ask that they put a due diligence list together before proceeding to make sure it is reasonable and appropriate. At the end of the due diligence period, we ask the buyer to present a draft of the purchase agreement and other documents necessary to close (in some cases, it may be more appropriate for the seller to generate a purchase agreement). Also during this time, if financing is required, we may work with the buyer to secure it. When the purchase agreements and other closing documents are finalized between both party’s attorneys, then a closing date can be finalized. We’re there representing the seller and working with the buyer every step of the way. Typically from the time of offer till closing takes between 60 and 90 days.